Badger Bates comes from the Paakantji people of the Darling River, western NSW. 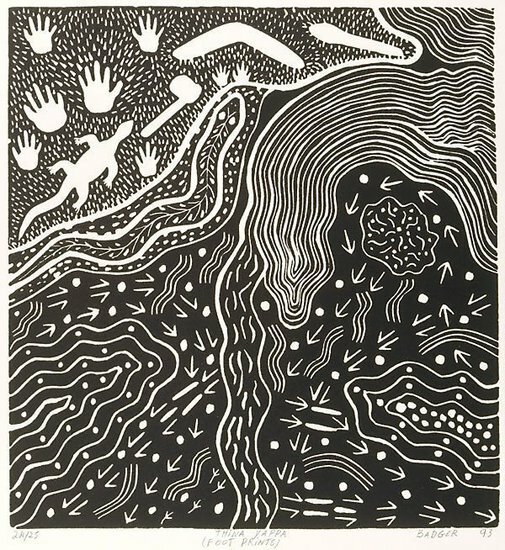 He has been central in encouraging local Aboriginal people to make linocuts by teaching and promoting the 'Far West School' in other centres. He first made linocuts with designs he had been carving on emu eggs since childhood; the new medium enabled him to make more detailed compositions. He uses traditional Aboriginal motifs and designs based on the region's rock art (engravings, stencils and paintings) and the wavy, geometric designs found on local wooden artefacts. His themes include depictions of local sites of significance and aspects of traditional lifestyle as well as Dreamtime stories. "This is at Mutawintji. Emu and Kangaroo are coming in to drink. Nhatji is there. Boomerangs, goanna and hands and the tommy-axe (a stencil) are all at Mutawintji". Signed and dated l.r. corner, pencil "BADGER 93".